Xalótcan is a brutal society, steeped in death and sacrifice, where the bloody gods of the Aztecs demand tribute from a fearful and superstitious population. But that’s the least of Colonel Jack O’Neill’s problems. 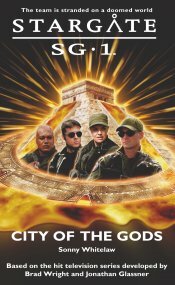 With Xalótcan on the brink of catastrophe, Dr Daniel Jackson insists that O’Neill must fulfil an ancient prophesy and lead its people to salvation. Special section: Excerpts from Dr Daniel Jackson’s mission journal! Dabruzzi ran past them without pausing. Jack coughed, then coughed again, clinging to the pain searing his throat, an anchor against a different pain, one he could never articulate. Something wriggled inside his cape. He glanced down at the miniature dog, Spiffy. They hadn’t been able to find the tunnel to the surface until it had jumped out of the cape and scampered up behind a rock fall. The animal had saved them, but it might have only delayed the inevitable. Jack reached in, unconsciously reassuring it with a gentle pat, feeling its warm life against his hand. “Our friendly neighborhood volcano decided to erupt all over the Stargate.” He swallowed the grit in his mouth and stood.